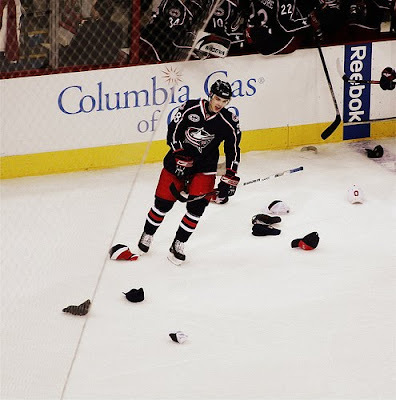 Hockey Plumber: Columbus and Filatov: Creating Zherdev Part II? On Tuesday the Columbus Dispatch reported that "Blue Jackets rookie forward Nikita Filatov, who has struggled to remain in coach Ken Hitchcock's lineup, might be headed back to Russia, perhaps as soon as this week..."
On Wednesday the Blue Jackets agreed to loan him to CSKA Moscow of the KHL for the remainder of the season. This situation is much more dicey than the team has let on. The Dispatch reported that coach Ken Hitchcock repeatedly has said Filatov has not been competitive enough, especially fighting for the puck and that Hitchcock had discussions with Filatov, telling him he did not want him to become another Nikolai Zherdev. Hitchcock had similar issues with Zherdev's game before he was traded to the Rangers. The real problem with this agreement is that it was orchestrated by Filatov. Last season he was sent to the Jackets' AHL affiliate in Syracuse. Filatov was very effective at the AHL level and made it very clear to the team that he would not accept another assignment in the minors. Therefore, the team moved to accommodate him by striking the deal with his former KHL club. "With another year of maturity and strength, and a really good offseason, Nikita should be ready to expand his horizons in the NHL," Hitchcock said. Will bending over backwards to appease a players demands encourage him to mature? Make him work harder? Teach him to battle and help him get stronger playing in a league that is much less physically demanding than the NHL? If Hitch does not want to see him become another Nik Zherdev, why would the Jackets send him to play with him?